As I remember it, a child came into school with one of those colouring books that have dot-to-dots and the occasional maze that you're meant to find the way through with your pencil. We started talking about how hard it would be to design your own maze. It ought to be easy, we thought. Definitely easier than making a birds nest. Though these were older children, and not the same ones. The children quickly figured out that you needed one pathway through the maze to the objective, and lots of dead ends to fool the victim. But it was hard to make the path through the maze un-obvious, and the dead ends were boring. Plus, if you went wrong when you were drawing it was hard to put it right without making a mess. So then we went out into the courtyard with every plastic and wooden brick we could borrow from other classes and made mazes using those. They were more like winding pathways than mazes, but it was definitely fun to do and we spent a couple of afternoons outside in the sunshine doing it. We were all thinking that a maze was something to get lost in, a place where it was hard to find your way out. 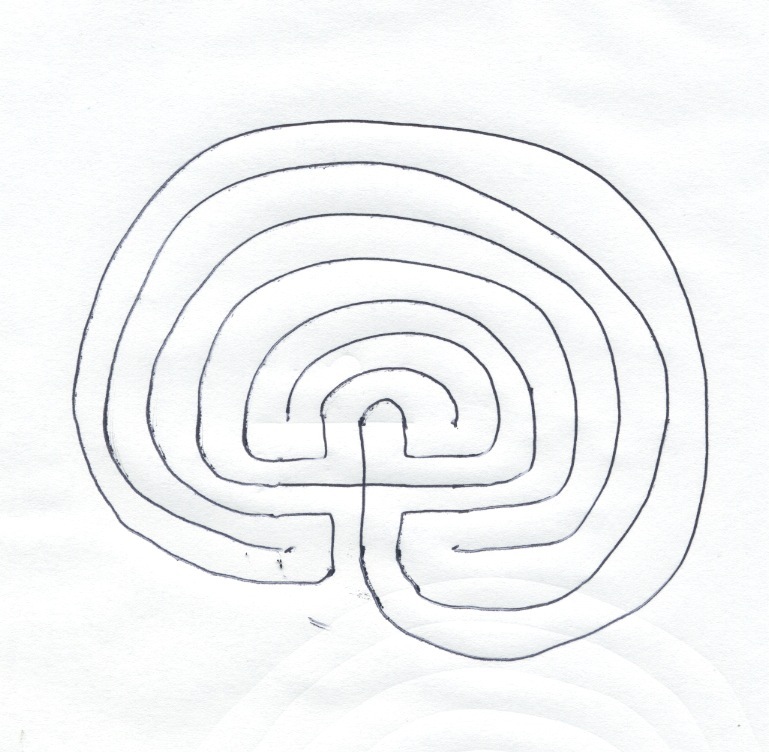 Then I came across a simple set of instructions for drawing the classical maze in the picture above. 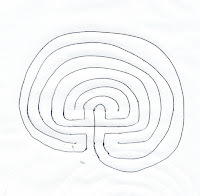 The maze has a single pathway that goes all the way to the centre and the pathway occupies the whole of the space. There are no dead ends and you can't get lost, but it's definitely a maze. So, I wondered how easy it would be to teach the children to draw one of these. They were 6, 7 and 8 years old, so I figured the older ones could help the younger ones. It took a couple of days, but eventually we could all do it. It felt just like being able to do magic. It's very like when I used to make rings and discovered that most people were completely baffled by the mystery of joining two pieces of gold together invisibly. People would look at the mazes the children had drawn and not have a clue how they'd done it. (Instructions for drawing the maze coming up next time! ).